“Nicole Eisenberg’s older son has wanted to be a star of the stage since he was a toddler, she said. He took voice, dance and drama lessons and attended the renowned Stagedoor Manor summer camp for half a dozen years, but she was anxious that might not be enough to get him into the best performing-arts programs. So Ms. Eisenberg and others in Bloomfield Hills, Mich., the affluent suburb where she lives, helped him start a charity with friends that raised more than $250,000 over four years. ‘The moms — the four or five moms that started it together — we started it, we helped, but we did not do it for them,’ Ms. Eisenberg, 49, recalled. ‘Did we ask for sponsors for them? Yes. Did we ask for money for them? Yes. But they had to do the work.’ She even considered a donation to the college of his choice. Ms. Eisenberg’s son was admitted to two of the best musical theater programs in the country, she said, along with nine more of the 26 schools he applied to. 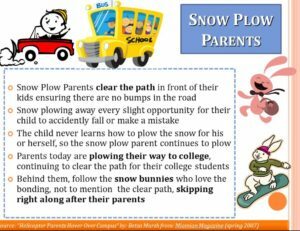 Or was she, perhaps, a … snowplow parent? Helicopter parenting, the practice of hovering anxiously near one’s children, monitoring their every activity, is so 20th century. 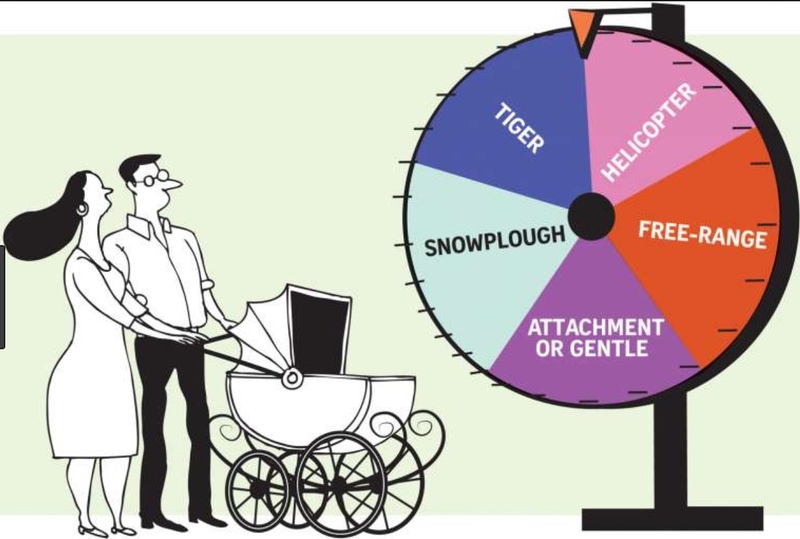 Some affluent mothers and fathers now are more like snowplows: machines chugging ahead, clearing any obstacles in their child’s path to success, so they don’t have to encounter failure, frustration or lost opportunities. Taken to its criminal extreme, that means bribing SAT proctors and paying off college coaches to get children in to elite colleges — and then going to great lengths to make sure they never face the humiliation of knowing how they got there. 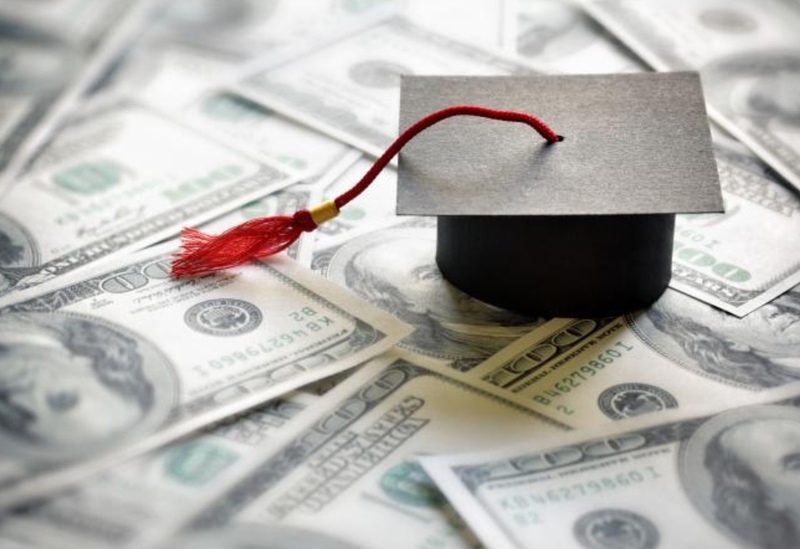 Those are among the allegations in the recent college bribery scandal, in which 50 people were charged in a wide-ranging fraud to secure students admissions to colleges. According to the investigation, one parent lied about his son playing water polo, but then worried that the child would be perceived by his peers as ‘a bench warmer side door person.’ (He was assured that his son wouldn’t have to actually be on the team.) Another, the charges said, paid someone to take the ACT for her son — and then pretended to proctor it for him herself, at home, so he would think he was the test-taker. The parents charged in this investigation, code-named Operation Varsity Blues, are far outside the norm. But they were acting as the ultimate snowplows: clearing the way for their children to get in to college, while shielding them from any of the difficulty, risk and potential disappointment of the process. 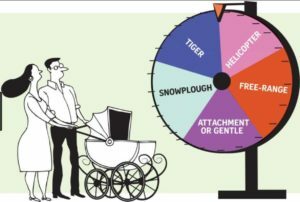 In its less outrageous — and wholly legal — form, snowplowing (also known as lawn-mowing and bulldozing) has become the most brazen mode of parenting of the privileged children in the everyone-gets-a-trophy generation. It starts early, when parents get on wait lists for elite preschools before their babies are born and try to make sure their toddlers are never compelled to do anything that may frustrate them…Later, it’s writing them an excuse if they procrastinate on schoolwork, paying a college counselor thousands of dollars to perfect their applications or calling their professors to argue about a grade. Madeline Levine, a psychologist [said] ‘They’ve cleared everything out of their kids’ way,’ she said. The destination at the end of the road is often admission to college. But college admissions have become more competitive…’Increasingly, it appears any mistake could be fatal for their class outcome,’ said Philip Cohen, a sociologist studying parenting and inequality at the University of Maryland. 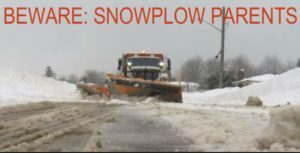 The problem is: Snowplowing is a parenting habit that’s hard to break. 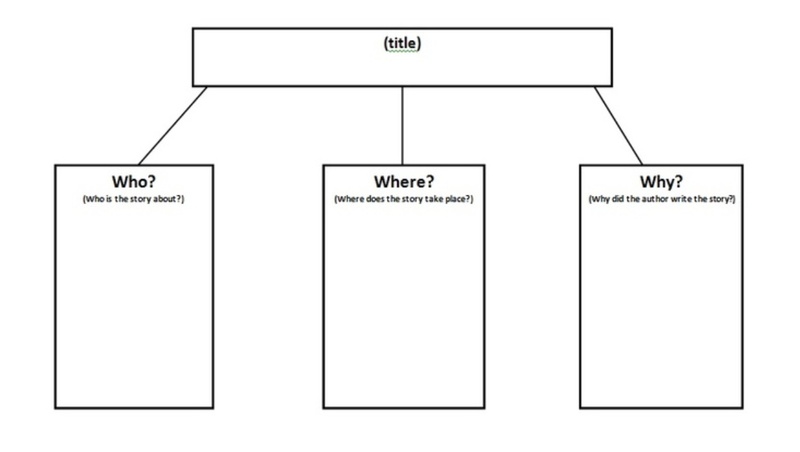 Directions: Ask students to examine the title of the post and of the actual article they are about to read. Then, have them examine the photos. Ask students to write a paragraph describing what they think this article will discuss. 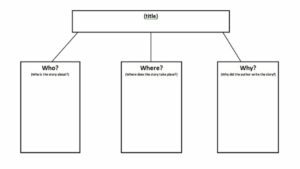 Students can use a Pre-reading organizer for assistance. The boy attended the renowned school of acting. Many parents are anxious about their children. Bloomfield Hills, Mich., is an affluent suburb. She even considered a donation to the college of his choice. College has been on their radar since her son was in diapers. Bribing SAT proctors and paying off college coaches is illegal. Those are among the allegations in the recent college bribery scandal. The child would be perceived by his peers as “a bench warmer”. The parents were acting as the ultimate snowplows. It starts early, when parents get on wait lists for elite preschools before their babies are born. Here is parents who have spent 18 years grooming their kids. It’s a parent’s job to support the children. If children have never faced an obstacle they will fail. Some parents never let their children make mistakes or face challenges. The point are to prepare the kid for the road. Helicopter parenting is a term that came into vogue in the 1980s. Parents spend more money on child rearing today. There’s an constant monitoring of what their kid is doing. A college degree has become essential to earning a middle-class wage. In a new poll by The New York Times and Morning Consult of a ___representative group of ___of children ages 18 to 28, three-quarters had made___for their ___children, like for___ visits or haircuts, and the same share had reminded them of ___for school. Sixteen percent of those with children in ___had texted or called them to ___them up so they didn’t sleep through a class or test. Eight percent had contacted a ___professor or administrator about their child’s ___or a ___they were having. 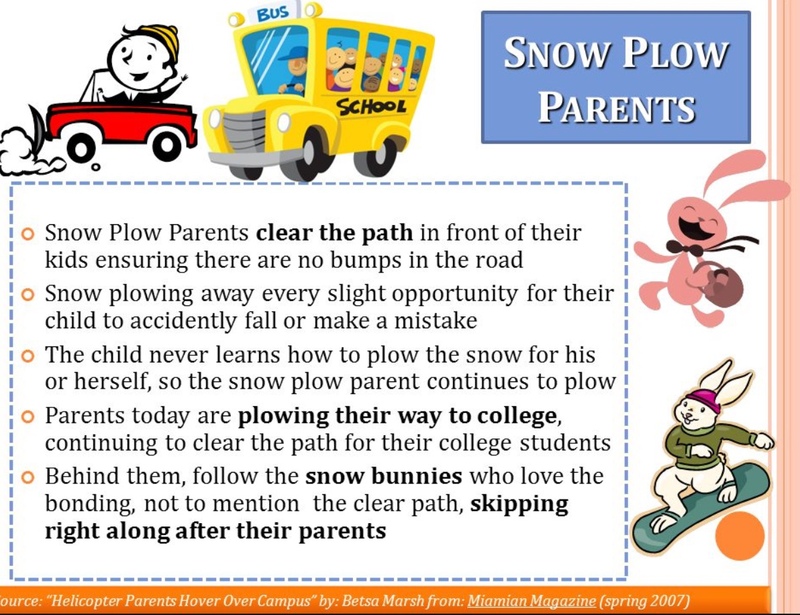 The article states, “Some affluent mothers and fathers now are more like snowplows: machines chugging ahead, clearing any obstacles in their child’s path to success, so they don’t have to encounter failure, frustration or lost opportunities.” What are your thoughts about snowplow parents? According to the description presented above, are your parents like this? Do you know of any parents who act like snowplows for their kids? If you were a parent describe how you think you would act when it came to helping your child through high school and college. In your opinion, were the parents in the scandal wrong to “pay” to help their children get admitted to colleges? Explain why or why not. Directions: Allow students 5 minutes to write down three new ideas they’ve learned about the topic from the reading, two things they did not understand in the reading, and one thing they would like to know that the article did not mention. Review the responses as a class.